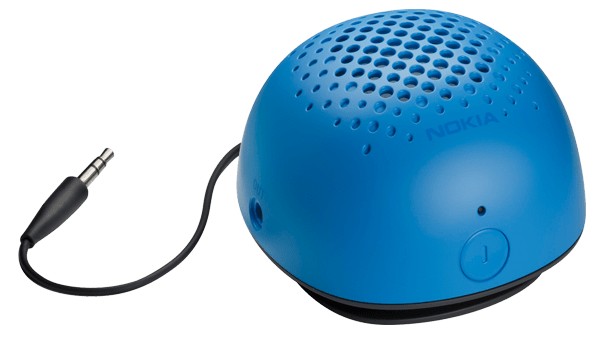 After watching our Quick Look video of the MD-11 Mini Speakers, you might have already figured out how useful the cute little white speaker from Nokia is. The small, lightweight, and portable speaker that runs on 3 AAA batteries seem like it was built for small social gatherings at the beach, picnics, parks, and any small impromptu parties – or even just watching movies on mobile devices or sharing a song or two with your friend without having to strain to hear the audio produced by the tinny speakers of our mobile devices. So does the Nokia MD-11 speaker achieve these goals? Read on to find out. 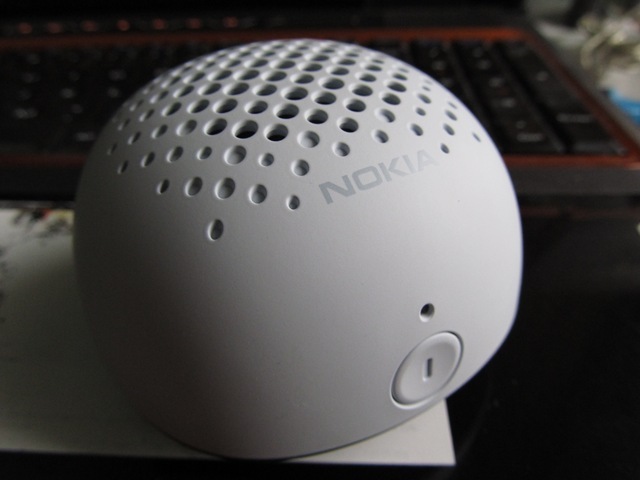 The Nokia MD-11 is a palm-sized speaker that is shaped like a dinner roll. It has large holes on the top for its 40mm speaker driver, a power toggle, power indicator LED, and an expansion port for stereo playback. On the bottom there is a rubberized cover with a smart cable organizer that also doubles as its grippy feet, and a tab for pulling to expose the AAAx3 batteries to power the device. The speakers is just the perfect size to fit in almost any bag and is great to take along for any sort of occasion. The cable organizer is secure and keeps the cable safe during transport, and the overall build quality is superb – there are no loose parts and hollow plastic that you will feel while using the device. The MD-11 generates some decent quality amplified audio despite it’s small size. Compared to regular tinny mobile devices, the MD-11 sounds a lot fuller, with a predominance to middle frequencies, as compared to the tinny high notes of our smartphones. Because it can play lower frequencies, the sound penetrates more into the surrounding area and not get drowned out – this is perfect for outdoor environments where there can be a lot of ambient noise. Battery life is also pretty excellent. The AAA batteries can last pretty long and I haven’t had the need to replace them in the whole time I’ve been using them. While testing the speakers, I found that whenever I would play a YouTube clip on my phone or just have the urge to play a quick song that I’ve had in my head, then I would pick up the speakers from my bag and have it play from the device. Bringing the speakers along while hanging out with friends was also a great experience. In our small group, everybody was excited to share the music they have stored on their phones. Normally, this wouldn’t have been possible because mobile phone speakers weren’t meant to be heard by a group of people – especially in a large, public area. But with the MD-11, we had no problems enjoying each other’s company with everybody’s music playing in the background. One of our musician friends even complimented the speakers for being so small, portable, and powerful that it might be the perfect companion to take with him so that he could share his latest recordings to his band. Overall, the MD-11 Mini Speakers proved to be a very useful companion especially for a guy like me who spends a lot of time with his mobile devices and, if possible, with friends in social gatherings. It is perfect for a great many occasions – for personal audio consumption, for listening to podcasts, to music, to watching movies on-the-go, and sharing a great day with your friends. The extra power and bump in audio quality makes the experience all the more enjoyable for all involved and will truly be a nice little gadget to have in your bag. If you plan on using your mobile device a lot, you should get one of these. They’re available at Nokia stores in White, Black, Blue and Red. sir where can i buy this speaker? nice review anyway!